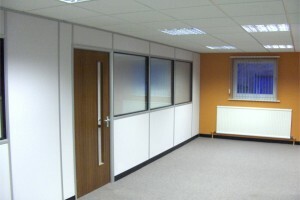 Over the years we have supplied and installed many different makes of office partitions but Tenon Office Partitioning seems to always provide the best mix of quality, value for money and range. 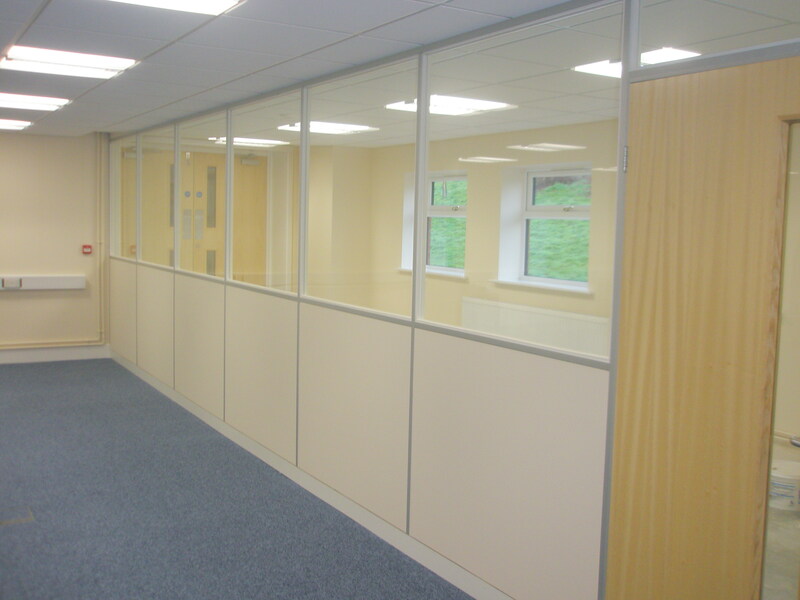 Below is the range of tenon partitioning we can design and build for you, of course we can still supply and install most of the other makes as well if you wish, just get in touch and we will be happy to provide you with a no obligation free quote. 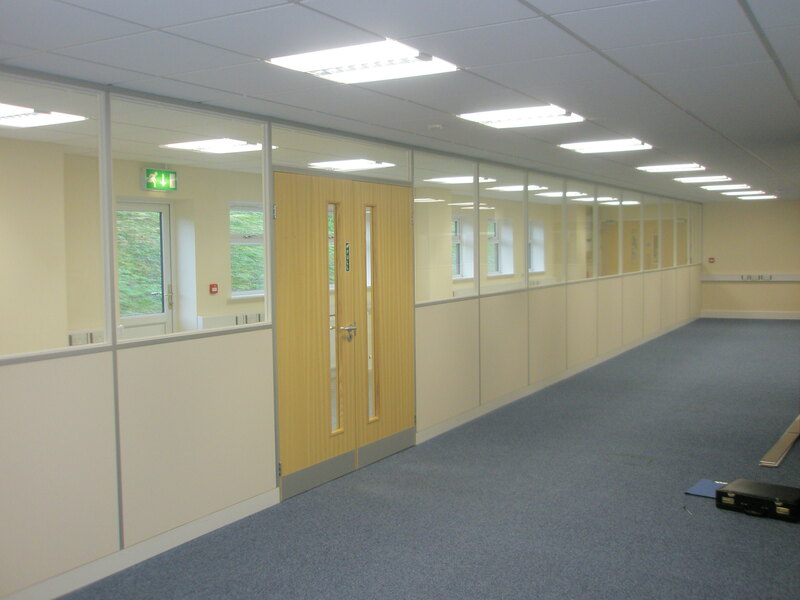 Flexplus 50mm thick partitioning system provides a cost effective and versatile range of aluminium frame modular partitions for use in office environments where a simple, practical office divider is required and maximum sound reduction is not required. The whole system is built using aluminium H shaped upright posts and head channels with steel shoe pan sets screwed to the floor. 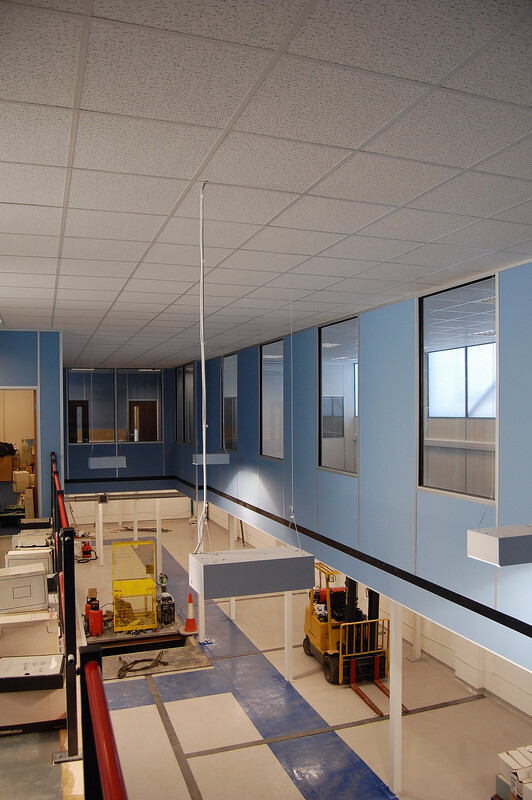 9.5mm double sided gypsum plasterboard faced honeycomb panels decorated with vinyl are inserted into the aluminium frame to form the solid sections of the system and wooden / laminated panels are available for use in cleanrooms etc. The Flexplus partition system is available with single or double glazed windows that can accommodate 15 mm and 25 mm integral blinds. Flexplus partition doors are available with many differing veneer finishes, with or without glazed vision panels, 44mm thick and hollow core in construction. 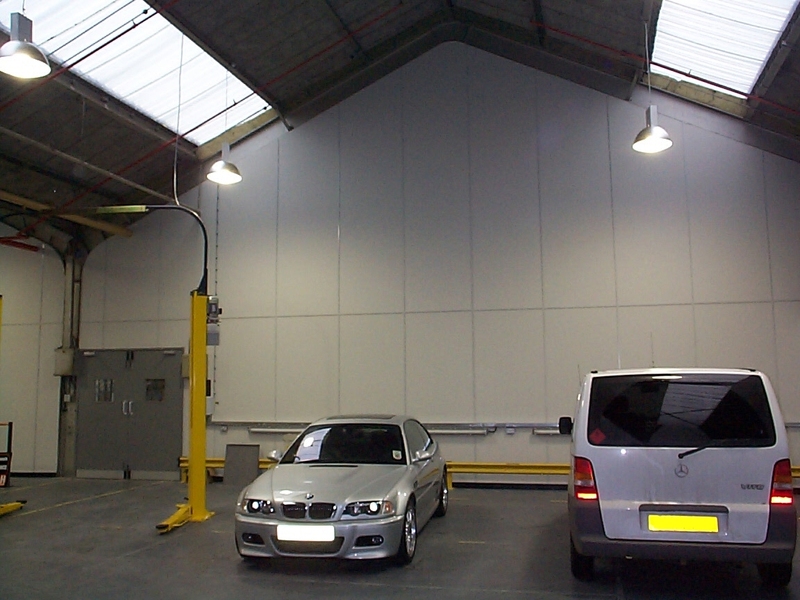 Composite aluminium partitioning is based around a standard module width of 1200 mm wide, Flexplus partitions can be used to create cost effective room dividers from 1m low barrier height up to 6m high and are fully demountable and re-locatable partition system. They are Non Fire Rated Partitions, 50mm construction with a Sound Rating: of Max 29db Rw on partition doors, solid and glazed modules. 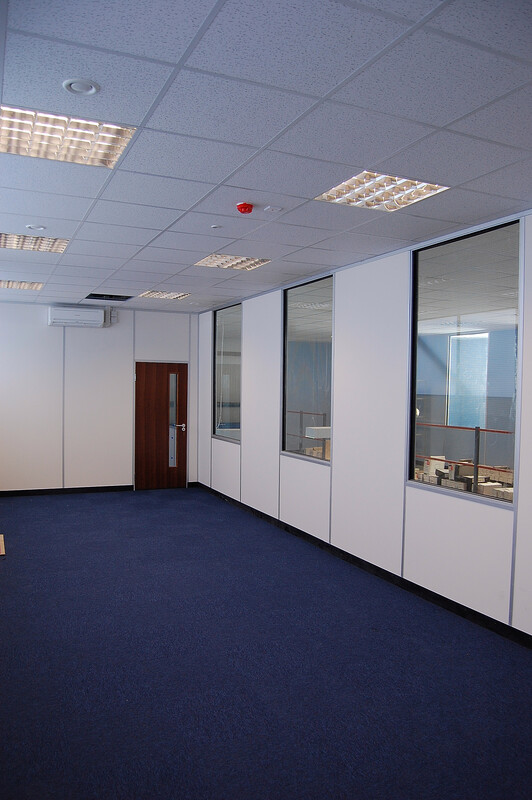 Fire & Sound partitions are versatile, demountable and re-locatable office partitioning systems designed for use in office and light industrial areas. 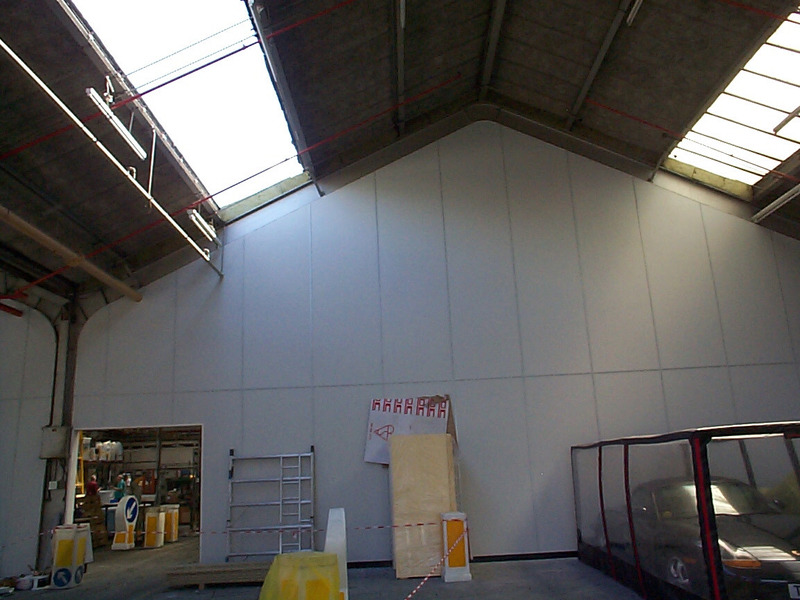 Constructed from 50mm or 75mm thick steel studs, the void is usually filled with rockwool acoustic insulation slabs and aluminium or plastic cover trim profiles (or omega trims with inserts) are used to retain the 12.5mm plasterboard panels each side finished with a range of washable vinyls. The stud and track partition system offers a high degree of flexibility in design coupled with high performance and good aesthetics, both single and double glazing is available with or without integral blinds. Fire and sound partition doors are available with many differing veneers, with or without glazed vision panels, are 44mm thick heavy duty and solid core in construction. Like Flexplus the standard module width is 1200mm but this is much more flexible. Maximum construction height is determined by the choice of stud and track section sizes, reaching a maximum height of 4200mm using standard components. 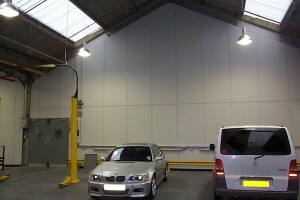 Jumbo stud measuring 150mm thick is available to enable fire and area separation walls to be built to 6m+ high, these are also often used in warehouses and factories to provide full height separation between different tenants or different uses of the premises and can be fire rated up to 2 hours. The aluminium cover trim sections, top caps, skirting etc are all available in satin anodised finish, or in a range of twelve standard colours. 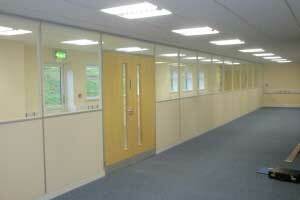 Fire Rated Partitioning: 30 and 60 minutes to BS 476 pt22 for doors, glazing and solid modules. Sound Rating: From 34dB Rw to 52dB Rw depending on size and type of solid / glazed modules chosen. Ovation partitions is a state-of-the-art system designed to remain at the forefront of partition wall / room divider development well into the future. 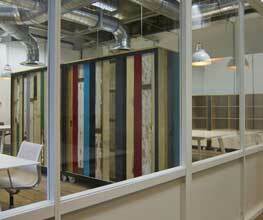 Ovation's styling provides gently radiused upright posts and door frames with a choice of recessed or flush skirting. Standard module widths are 1209mm. Glazed elements include an innovative integral transom feature providing a cost-effective option to standard banded / stacked glazing. An almost unlimited choice of RAL or BS colour finishes offer the potential to tailor installations to suit any corporate environment. Innovative Bi-element construction allows rapid on-site assembly without lengthy lead times. 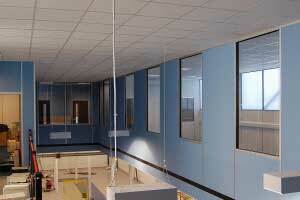 Ovation is fully demountable and re-locatable thanks to the push fit interpanel trims. Vitrage is a full height glazed partition system that combines function with the clear aesthetic benefits of silicone glazing. 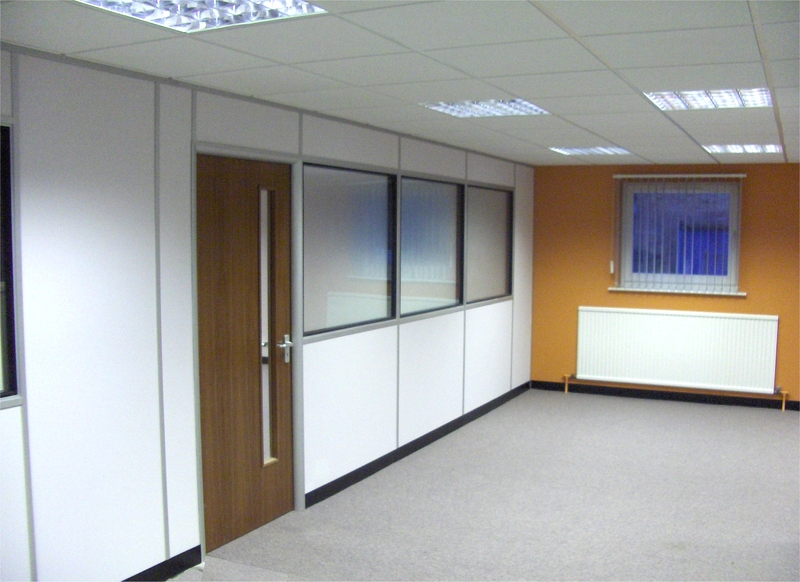 Using slimline aluminium top, side and floor framing sections, Vitrage partitioning provides an office divider wall that allows excellent vision while still maintaining the relative privacy of individual offices / meeting rooms. Using either 10 mm or 12 mm toughened glass, depending on the height of the partition, rapid glazing is achieved with the use of standard Tenon crystal clear glazing gaskets that remove the need for use of silicone around the perimeter of the system. Vertical silicone joints maintain the visual simplicity of the product, (crystal clear plastic jointing sections may also be used to provide dry joints between glass panels). Glass doors are available with non locking furniture as standard, however locking door furniture and door closures are available, as are aluminium door frames. Obscure manifestations are required to prevent people walking into the partition walls and these can be basic small dots to bespoke patterns / designs or even your logo in colour or etched glass effect. 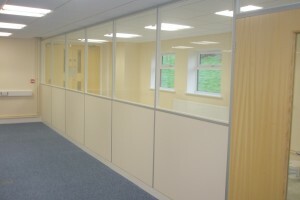 Scion wood framed partitioning combines the visual appeal and luxurious finish of natural wood with the flexibility and performance of a contemporary partition system. The system is ideal for use in boardrooms and executive areas, but also affords a practical and durable solution for general office areas. Scion is manufactured from solid timber using an attractive range of sustainable hardwoods and other suitable timbers, allowing endless design and build options. 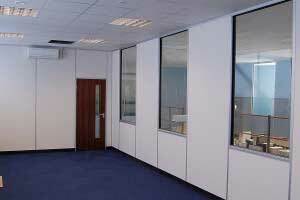 Built to a patented method of largely modular construction, the partition walls are simple to install. Available in solid, single and double glazed formats, the system can incorporate silicone glazing and integral Venetian or Vertical blinds. Fire Rating: 30 and 60 minutes to BS 476 pt22 doors, glazing and solid modules including insulated glazing Sound Rating: From 34dB Rw to 52dB Rw on solid modules. 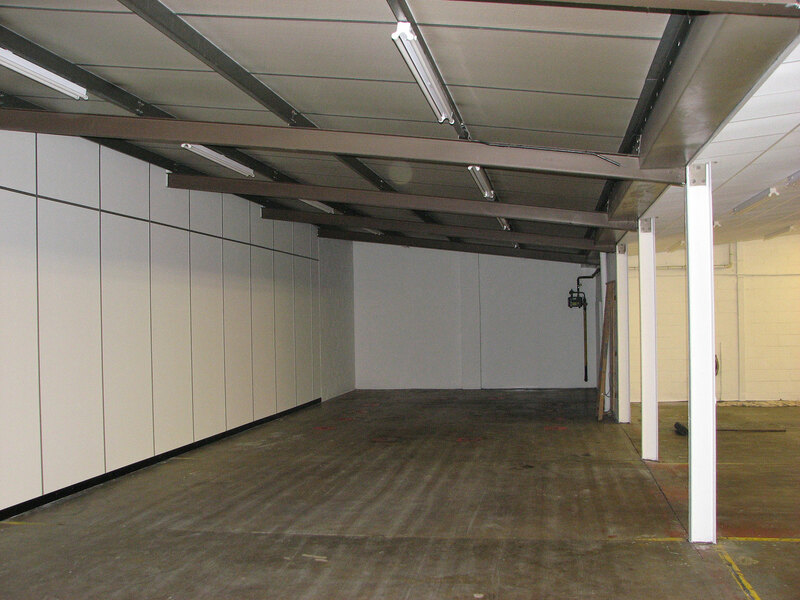 Wall Store is a simple but very effective concept, which utilises full ceiling height modular storage units / cupboards to provide an integrated wall storage partitioning system. The system provides compact and streamlined storage which can be used as both free standing room dividers or as partition walls for cellular offices. 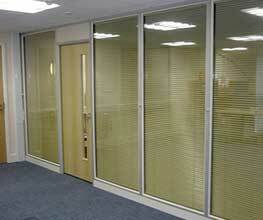 It has been designed to integrate with and to complement the range of Tenon partitioning systems. 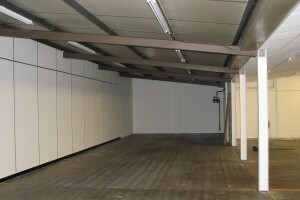 Demountable and re-locatable, Wall Store is an ideal solution for high density storage, as it optimises the space normally wasted above traditional freestanding shelving units and looks a lot more pleasing on the eye. The resultant saving in rent and rate costs can be substantial and provide a rapid return on investment. A wide choice of internal shelf fittings are available, offering extensive permutations, from standard shelving, to high density filing to audio-visual presentation systems. 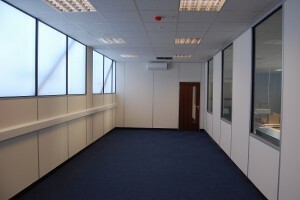 The Tenon Office Partitioning systems are extremely versatile and we would be happy to help you design and build your next offices or refurbishing your existing.